Why doesn't anyone tell me these things?! Last year, I made my third trip to Syros (TLO has done many more), and we finally visited an incredibly impressive church located in a huge, secluded seashore cave that for some reason, nobody had bothered to mention to us. 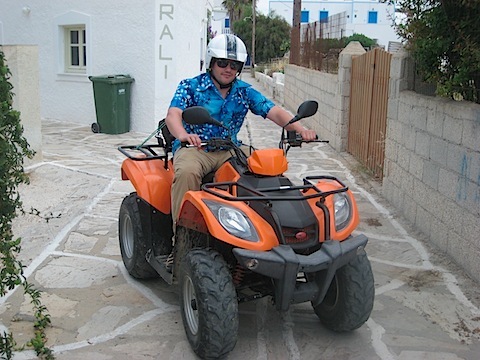 Note that TLO's father grew up on Syros. Her uncle still lives here, and saw us almost daily on every one of these trips. Neither has even been there. This is roughly equivalent, in my opinion, to living in Vancouver and not visiting the Sun Yat-Sen garden. Continuing that theme, we did a side trip to the island of Paros, mainly with the goal of visiting sister island Antiparos (great name, right? the third island in the group is called Despotiko. Really). This was our second trip to Paros over the years, but we'd never been to Antiparos. You take a very short ferry-trip from Paros to get there. 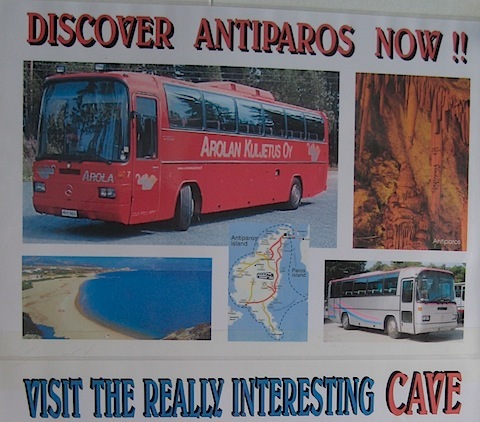 And somehow, so far, nobody thought to mention the REALLY INTERESTING CAVE! Yes, TLO has a guidebook that notes it as one of the highlights of the island, but we're talking about a thing that drops 100 metres into the depths, is cavernous enough that it can be explored by normal people (with the caveat that the trip to the bottom and back involves 100m of vertical stair-climbing), and that is impressively riddled with stalactites and stalagmites. 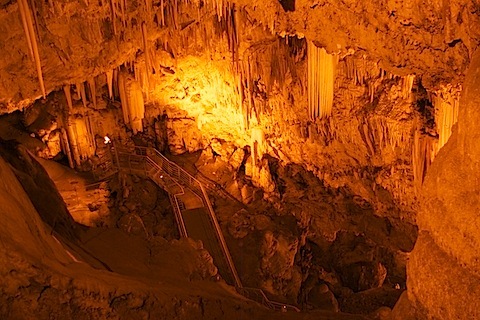 If you go anywhere near the Cyclades and don't visit the Cave of Antiparos, you're missing out. I hope that gives some sense of the scale and verticality of the cave. This isn't a top-to-bottom view. It's not possible to see clear from the lowest point back to the mouth. It's like Steve McQueen and Magnum P.I. had a fat love-child. "Quads" are so named because they tend to make their users into quadriplegics. Not really. 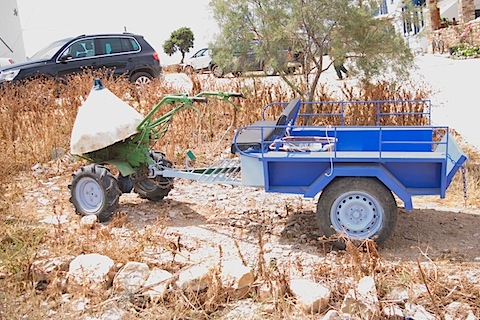 But only in Greece would such a thing be considered legal road transport, as opposed to an entertaining mechanism for off-road self-harm. Compared to a scooter, this thing is incredibly unstable, and it feels it. With two people aboard, it was so obviously dangerous going around corners that it was the safest vehicle imaginable: I was unwilling to take even the slightest bend at more than 20 km/h. That was fine with the machine, since it had a 50cc engine and the clutch slipped up any slope, so I had to nurse it along at single-digit speeds in some cases. TLO liked it because the seat was comfy. I liked it because I like danger. It cost 15 Euros; that's a value proposition I can get behind. That's not a joke. You really are looking at a rototiller turned into an improvised motor vehicle. I have seen these being driven on the road. So yeah, I love Greece.